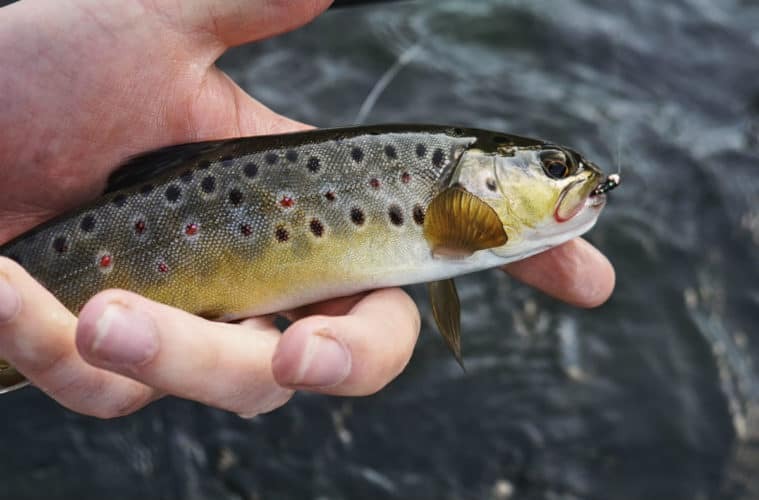 One of the first questions a novice trout angler may ask would probably be – What do trout eat? The answer to this question seems simple enough, but upon taking into account the various type of environments trout occupy you will appreciate the fact that menus of different trout populations may differ quite substantially. Let me start by stating that trout eat most of the other organisms, be they vertebrates or invertebrates, they share their environment with. These are, mostly, insects in various stages of their respective life cycles as well as other fish, crustaceans and amphibians. However, trout can be found in both rivers and still water impoundments like lakes and dams. As a result of these two different environments the diets of these diverse populations also differ to a certain extent. In this article I want to focus on which food items you can expect , which artificial flies you can use as well as which tactics to apply in order to be successful. Where Would I Find Lake Trout? The first important thing to establish is where lake trout tend to hang out. Every time you approach a body of water for the first time, try and figure out what the underwater topography may look like in order to focus your attention on the areas where trout are most likely to congregate. In this way you will save yourself hours of wasted time and frustration due to hunting for them in unproductive spots. In lakes there are three main areas you should focus on: 1) Inlets of rivers, streams and creeks entering the lake, 2) deep water spots close to the shore and 3) shallow water areas with aquatic vegetation. My personal strategy is to look for fish in the deeper spots during the day and then concentrate on the shallows during the early mornings and late afternoons. What Do Lake Trout Eat? If you fish close to the bottom you can expect trout to be on the lookout for all kinds of bottom-dwelling organisms. Food items like crabs, shrimps, snails and insect larvae using the bottom sediment and rocks as cover will feature quite prominently. However, if we shift our focus to the shallow areas which normally contain lots of aquatic vegetation and much higher levels of sunlight we will observe a multitude of water borne insects like mosquitoes, gnats, mayflies, dragonflies and caddisflies inhabiting this zone during the different stages of their respective life cycles. Which Fly Patterns Do I Use for Lake Trout? For the deeper parts of the lake bigger is definitely better. Big wet flies and streamer types like Muddler Minnows, Mrs Simpsons, Walker’s Killers and Woolly Buggers are the type of flies to employ in these conditions. I would suggest sizes ranging between 2 and 8 to be appropriate. All these flies must naturally be tied onto a tippet of, at least, a metre in length at the end of a sinking line. What Tactics Do I Employ with a Sinking Line? In order to get to the bottom you have to make allowance for the fly line to sink down to that specific depth before you start the retrieve. Once your fly is on the bottom you can start retrieving. Now is the time to experiment with various retrieving speeds in order to establish which one of those retrieves will induce the trout to attack your fly. Short strips or figure-of-eight retrieves normally work best. It is also important to keep in mind that that, more often than not, your best tactic is to slow down your retrieve rather than speeding it up in order to imitate the natural behaviour of the prey you are trying to imitate. What About Fishing the Shallows of a Lake? When you are fishing the shallows of a lake, though, a floating line with a leader length of a meter and a halve as well as a tippet of the same length will do. Because of the relative shallowness of the water I prefer to use a non-weighted fly which can slowly sink to the bottom as it absorbs water. Because of the variety of insects in different sizes, shapes and forms your choice of fly is almost boundless. You can select from tiny emerger patterns, various nymphs (both weighted and unweighted) to bulky dragonfly imitations to imitate the local insects. I consider a retrieve involving short, punctuated strips imitating some or other water borne insect, slowly making its way to the surface to enter the next stage of its life cycle, as one of the better ways to fish these patterns. Where Would I Find Stream Trout? Shifting our focus to trout in a river, small stream or a creek we encounter very skittish fish. This is because they have to contend with relatively clear and shallow water which gives them limited protection from all kinds of predators. For these paranoid trout it is very important, as an angler, to keep your profile as low as possible at all times and approach any potential trout lie with caution. While fishing upstream you also have to constantly keep in mind that trout normally position themselves in an upstream direction in order to ensure a free flow of oxygenated water over their gills and also to intercept any edible food items carried downstream by the current. From a tactical perspective it is therefore quite important to get into the water whenever you can. Apart from immediately lowering your profile you also position yourself in the blind spot of most fish facing upstream which will allow you to stalk them unobtrusively. Trout instinctively seek out locations where the current is less strong in order to preserve energy. So be on the lookout for obstacles as you move along, because that’s where fish find refuge against the never ending current. These obstacles may take the shape of fallen trees, logs, sand banks and rocks. Once such a potential hiding place is observed, try to get as close as possible before casting your fly. Avoid making too many false casts because any unnecessary movement may alert a wary fish. What Do Stream Trout Eat? The diet for trout in streams does not differ that much from what lake trout eat, but there is definitely a marked difference in size and variety. Whereas lake trout inhabit areas which have a relatively stable water volume and have access to deep recesses where crabs, frogs and other organisms may grow to substantial sizes, trout in rivers and streams normally do not have the luxury of those kind of nutritional bonanzas. Most mountain streams are free stone rivers which means they are subject to dramatic seasonal changes as far as their water content is concerned. Depending on the season and conditions, one season may be one of abundance whereas the following one can be a period of relative famine. Due to the constant movement of water, water plants and other vegetation do not have the opportunity (compared to lakes) to take a firm foothold and proliferate due to stable water levels. As a result, most free stone rivers cannot sustain as many organisms and are relatively nutrient poor. Insects like stone flies, caddis flies, gnats, mosquitoes, mayflies and dragon flies are the kind of insects one can expect on rivers. Because these insects share the same ecosystem as river trout the latter hunt them actively in almost all the stages of their life cycles. They form the bulk of the food of stream trout. However, quite a big portion of a trout’s diet also includes various species of terrestrial insects. These unfortunate creatures have no real desire to be in the drink, but often find themselves there due to a variety of reasons. Ants, cicadas, grasshoppers, wasps, spiders, bees and beetles of all kinds find themselves in this predicament more often than not. As you can imagine, a big grasshopper represents a huge nutritional bonanza for a hungry trout and as a result one should always carry at least one or two bulky flies on you when visiting a stream or river. As a logical consequence artificial flies for streams will differ quite considerably in size compared to those needed on lakes, but one should also keep in mind that crabs and big dragonfly nymphs do inhabit the deeper parts of most streams. One should therefore always be in possession of such imitations whenever you venture out onto a stream or river. Which Fly Patterns Are Best for Stream Trout? Classic patterns like pheasant tail, gold ribbed hare’s ear and variations on those tied in colours ranging between black, dark brown, tan and mottled on hook sizes 12 to 18 are as generic as you can get and will stand you in good stead where ever you fish. As far as catskill patterns go classic flies like Royal Wulff and Adams come up trumps every time. The Adams tied in a parachute pattern is also a deadly weapon. Because terrestrial insects are a common feature on freestone rivers I fished them often. Here we have the Caribou Spider and also two very effective South African patterns namely the DDD (also tied with deer hair) and the RAB which imitates long legged insects like spiders etc. Of course you need a reliable grasshopper pattern and here I am a staunch supporter of the Dave’s Hopper. One of the most productive dry fly patterns, which is also easy and quick to tie, is a caddis fly imitation which I tied on size 16 or 18 hooks. So, there you have it. Armed with this knowledge you can now confidently stock up with the right fly patterns in order to imitate a trout’s diet. One last point, though. As with most other things in life we have to keep in mind that every individual develops a specific preference for things due to his/her unique personality and circumstances. The same obviously applies to fly fishing and the choice of flies. There is therefore no reason to constantly worry about choosing the perfect fly at all times, because it is totally unnecessary. As long as you do your homework pertaining to the specific location you are fishing, including the target species and their diet, you should be fine. The most important thing to remember when fly fishing, though, is to have faith in the fly at the end of your line. Be aware of what you are doing, focus on the right tactics and strategy and success will surely follow.